An object which can be rendered in the HTTP protocol. Besides the main page, other objects may be rendered as additional resources, for example documents or images. Classes such as WAnchor or WImage can use a resource instead of a URL to provide their contents. Whenever the resource has changed, you should call the setChanged() method. setChanged() will make sure that the browser will use a new version of the resource by generating a new URL, and emits the dataChanged() signal to make those that refer to the resource aware that they should update their references to the new URL. You can help the browser to start a suitable helper application to handle the downloaded resource, or suggest to the user a suitable filename for saving the resource, by setting an appropriate file name using suggestFileName(). To serve resources that you create on the fly, you need to specialize this class and implement handleRequest(). beingDeleted(); // see "Concurrency issues" below. Because of the nature of the web, a resource may be requested one time or multiple times at the discretion of the browser, and therefore your resource should in general not have any side-effects except for what is needed to render its own contents. Unlike event notifications to a Wt application, resource requests are not serialized, but are handled concurrently. You need to grab the application lock if you want to access or modify other widget state from within the resource. When deleting a resource, any pending request is cancelled first. For this mechanism to work you need to specialize the destructor and call beingDeleted(). This method may safely be called multiple times (i.e. from within each destructor in the hierachy). With respect to I/O, the current strategy is to cache the whole response first in a buffer and use async I/O to push the data to the client, in order to free the thread while waiting for I/O on a possibly slow link. You do not necessarily have to provide all output at once, instead you can obtain a Http::ResponseContinuation object for a response, construct the response piecewise. A new request() will be made to continue the response. By default, a resource is private to an application: access to it is protected by same secret session Id that protects any other access to the application. You can also deploy static resources, which are global, using WServer::addResource(). A resource may also handle the uploading of files (in fact, WFileUpload uses a WResource to do exactly that) or transmission of other large bodies of data being POST'ed or PUT to the resource URL. For these requests, it may be convenient to enable upload progress monitoring using setUploadProgress(), which allows you to be notified of data being received. Values for the disposition type in the Content-Disposition header. Do not specify a disposition type. Open with a helper application or show 'Save As' dialog. View with a browser plugin. When specializing a resource, you MUST call beingDeleted() from within the specialized destructor, in order to stop any further requests to the resource, unless it is guaranteed that no requests will arrive for this resource when it is being deleted, e.g. if the server is already stopped. Prepares the resource for deletion. When specializing a resource, you MUST call beingDeleted() from within the specialized destructor, in order to stop any further requests to the resource. Signal emitted when the data presented in this resource has changed. Widgets that reference the resource (such as anchors and images) will make sure the new data is rendered. It is better to call setChanged() than to emit this signal. setChanged generates a new URL for this resource to avoid caching problems and then emits this signal. Signal emitted when data has been received for this resource. When this signal is emitted, you have the update lock to modify the application. Because there is however no corresponding request from the browser, any update to the user interface is not immediately reflected in the client. To update the client interface, you need to use a WTimer or enable server-push. The first argument is the number of bytes received so far, and the second argument is the total number of bytes. Returns the currently configured content disposition. Generates an URL for this resource. Generates a new url that refers to this resource. The url is unique to assure that it is not cached by the web browser, and can thus be used to refer to a new "version" of the resource, which can be indicated by emitting the dataChanged() signal. The old urls are not invalidated by calling this method. Handles a continued request being aborted. This function is only applicable to a request for which a response continuation was created, and indicates that the client has been closed (or the resource is being deleted) before the response was completed. This function may be reimplemented so that you can close any resources associated with the response continuation. The base implementation is empty. Note that because this function could be called from within the destructor, you should not forget to call beingDeleted() from the specialized destructor of your resource. Reimplement this method so that a proper response is generated for the given request. From the request object you can access request parameters and whether the request is a continuation request. In the response object, you should set the mime type and stream the output data. A request may also concern a continuation, indicated in Http::Request::continuation(), in which case the next part for a previously created continuation should be served. While handling a request, which may happen at any time together with event handling, the library makes sure that the resource is not being concurrently deleted, but multiple requests may happend simultaneously for a single resource. 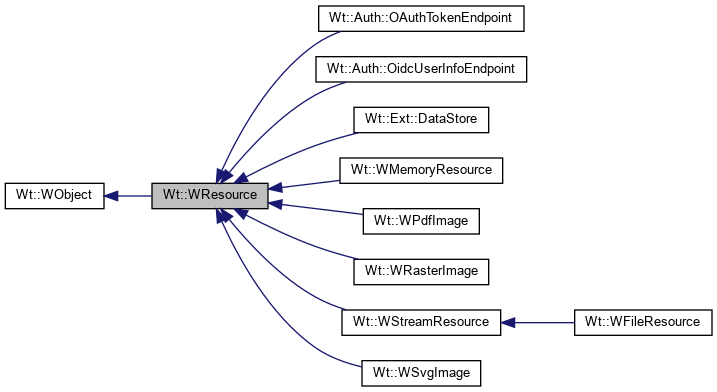 Implemented in Wt::WPdfImage, Wt::WRasterImage, Wt::WFileResource, Wt::WMemoryResource, Wt::WSvgImage, Wt::Ext::DataStore, Wt::Auth::OAuthTokenEndpoint, and Wt::Auth::OidcUserInfoEndpoint. Indicate that more data is available. In some occasions, data may be requested for a resource which is currently not yet available. Then you can suspend the response using a continuation which you let wait for more data. Using this method you can indicate that more data is available. This will resume all responses that are currently waiting for more data. If no responses are currently waiting for data, then this method has no effect. Generates a new URL for this resource and emits the changed signal. This does not work when the resource is deployed at an internal path using setInternalPath(). The Content-Disposition header allows to instruct the browser that a resource should be shown inline or as attachment. This function enables you to set this property. This is often used in combination with suggestFilename(). The Content-Disposition must not be None when a filename is given; if this case is encountered, None will be rendered as Attachment. Sets an internal path for this resource. Using this method you can deploy the resource at a fixed path. Unless you deploy using cookies for session tracking (not recommended), a session identifier will be appended to the path. You should use internal paths that are different from internal paths handled by your application (WApplication::setInternalPath()), if you do not want a conflict between these two when the browser does not use AJAX (and thus url fragments for its internal paths). The default value is empty. By default the URL for a resource is unspecified and a URL will be generated by the library. The internal path for a static resource is the deployment path specified using WServer::addResource(). Indicate interest in upload progress. When supported, you can track upload progress using this signal. While data is being received, and before handleRequest() is called, progress information is indicated using dataReceived(). Returns the suggested file name. Suggests a filename to the user for the data streamed by this resource. For resources, intended to be downloaded by the user, suggest a name used for saving. The filename extension may also help the browser to identify the correct program for opening the resource. The disposition type determines if the resource is intended to be opened by a plugin in the browser (Inline), or to be saved to disk (Attachment). NoDisposition is not a valid Content-Disposition when a filename is suggested; this will be rendered as Attachment. Returns the current URL for this resource. Returns the url that references this resource. Stream the resource to a stream. This is a convenience method to serialize to a stream (for example a file stream).